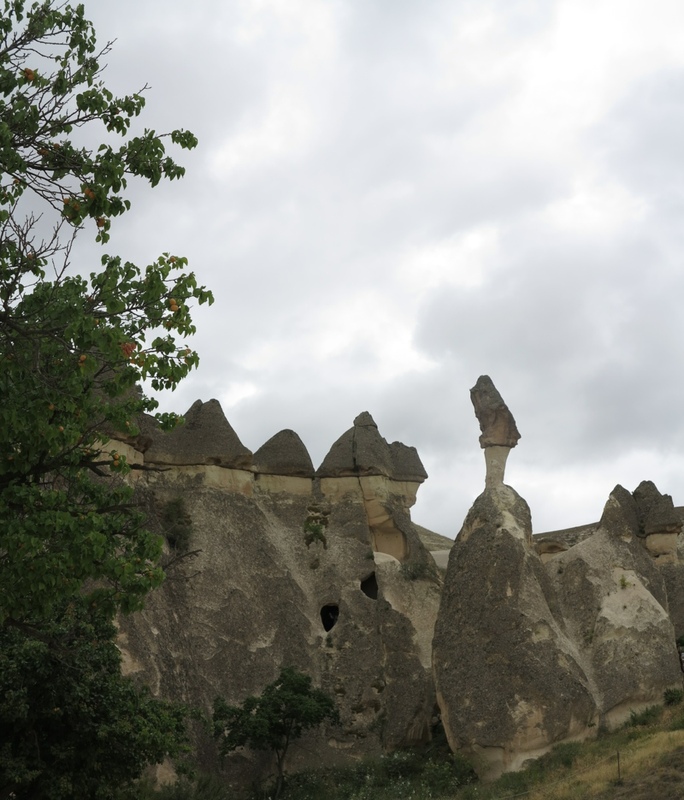 My trip to Turkey 8: Goreme, Cappadocia | Me fail? I fly! Circumstances have conspired against my routine of blogging about one destination on the bus ride to the next. The scheduled bus trip from Goreme to Istanbul was a 12 hour ordeal, not in the original plan but made necessary because the Istanbul railway station burned down and the powers that be decided to replace it with a hotel. The Art Student and I, and two others of our little band, chose to spend a little extra and fly. So no overnight haul for this blogger, no blogging on the road! But here I am, a little late, still on the iPad, but this time in the spaces where the Art Student lingers longer than I do in Istanbul’s many galleries. Taking up where I left off: a caravanserai is not, as you may think, a collection of ornate, tent-like structures. The one we stopped at, at least, is a fortress-like affair, with high solid walls, room for scores of camels inside its walls, a space for a substantial market, a mescit (a word used these days for the prayer room at an airport, but then for something much grander that served the same purpose). Two huge dogs lay about in the cool, dark rooms, but in response to our touristic invasion moved to the main entrance, where they took up the stance of lion guardians, languishing in the heat. A little longer in the bus, passing gently undulating summer-golden grassland, and then almost without warning we were in Cappadocia. This has to be one of the weirdest places on earth, not just because of the rock formations – resulting, we were told, from three volcanoes filling the space they enclosed with different kinds of lava, so that as the softer rock was eroded, strange, layered cones of harder rock were exposed, to erode in their turn creating what the tourist trade calls ‘fairy chimneys’ and geologists call ‘hoodoos’ – but because of the way the human, built environment and the natural environment accommodate each other. We went for a long walk – the Rose Trail – among rocks that have doors and windows carved into them, and everywhere niches that may have held lamps or candles (our guide said not, and there was no sign of blackening, so if it happened it was long enough ago for all traces to have washed away, but what else could they have been for?). In the town of Goreme, where we stayed three nights, there are similar pre-ancient niches, and also some broken Greek pillars, some Ottoman script, and many hotels and restaurants wholly or partly carved out of the rock. Near Goreme is the Open Air Museum, whose rocks contain Christian churches with wonderfully preserved frescoes from the tenth century CE, especially the ‘Dark Church’ which was discovered comparatively recently and so escaped the depredations of devout Muslim visitors who scratched out the faces in many of the other caves. It’s a mesmerising case of the natural environment and the built environment blending, and maintaining the blend over millennia of cultural and technological change. As well as walking and gawking, which is what this place demands, all 13 of us had dinner in the home of a beaming woman in Turkish headscarf, named Fatma. The home had a blessing in Ottoman script over the main door, and its rooms reached back into the rock. The dinner was delicious home-cooked food, which I realised I had been craving. When Fatma produced a display board of jewellery she had crocheted, she didn’t have to do any hard selling to have a number of the women enjoying themselves thoroughly trying things on and buying. 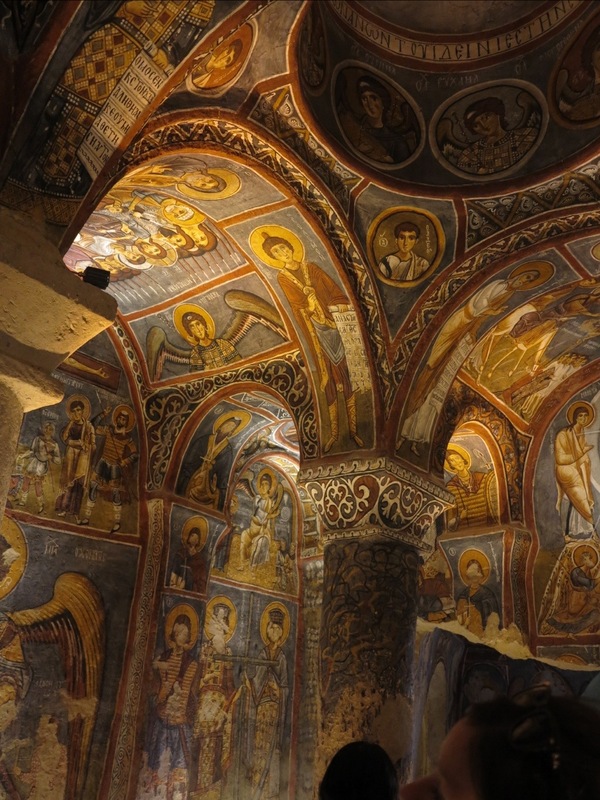 In Cappadocia we also visited Derinkuyu, an underground city where early Christians and others before them hid from persecution and attack. We dined on our last evening, just the four of us who had taken the plane option, at the Top Deck Cave Restaurant, which is Trip Adviser’s top rated restaurant in Goreme. We could see why. I didn’t go on a hot air balloon trip, partly because of the expense, partly because I was feeling a bit off and couldn’t face a 4 am rising, and partly, if truth be told because of Les Murray’s mean, class-envy poem about a hot air balloon accident (I don’t remember its name, and I’m embarrassed to be influenced by it). Those of our group who did go said it was marvellous and had spectacular video to show. 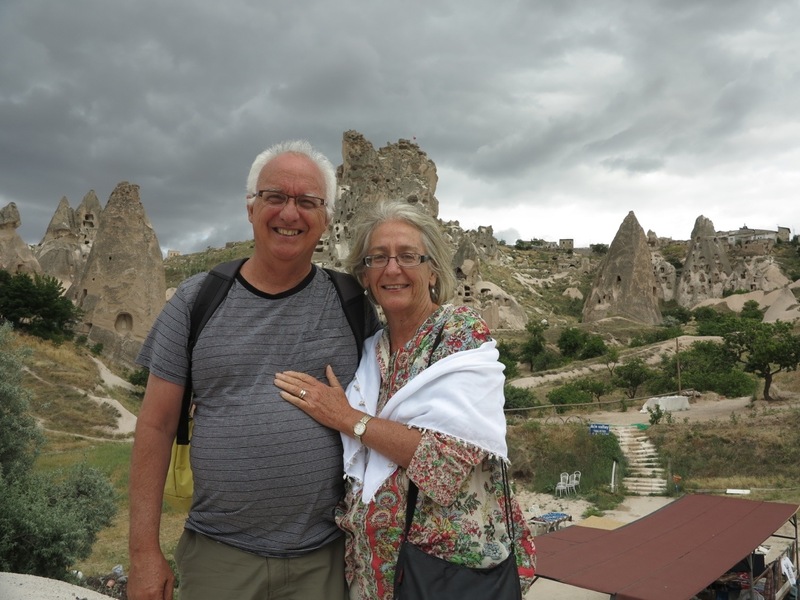 We said our final goodbyes in Goreme as the rest of them set off for the bus, then we saw most of them again when we arrived in Istanbul next morning, four hours after them, and said our final, final goodbyes. It was a lovely, exuberant group. Unlike other Intrepid groups I’ve travelled with, more than half were under 30. Of the over 30s, one was a Unitarian minister, who had a similar fascination with Christian theology to mine, though she was more learned than I am. And three of us – the Art Student and I and one other – were friends. One of the young adults was a blogger, though I think we both felt it would be weird to read each other’s blogs during the trip (his is at shootingtravellers.wordpress.com, and I plan to follow it now). It was a great mix. The Art Student and I had a great time, and now we’re on our own for another ten days or so. Great post, Jonathan, and good decision not to do the balloon trip. Everyone says it’s fabulous because everyone does it. There’s nothing original to be said or blogged about it. 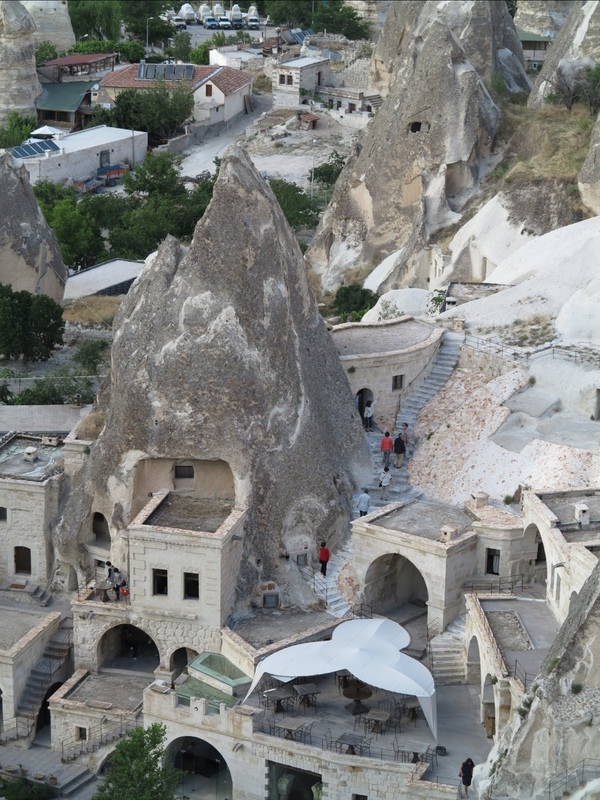 But if anyone would like to offer me a freeby…gee, that balloon trip over Cappadocia is not to be missed! I can see that the Art Student has a future as Art Photographer. Lovely work. Thanks, all. No disrespect to the Art student but it would be hard to take a completely uninteresting photo in that place. It’s completely fascinating. And Richard, I think a freebie would have had me up there too. One of our 20-somethings, who hadn’t been at all opinionated until then, said emphatically that everyone should go in a hot air balloon at least once in their life.